Expecting a baby is such a sweet, sweet time. While pregnancy has it’s less-than-glamorous moments, creating an amazing nursery is definitely one of the highlights. Not everyone has what it takes to design the perfect space for their little ones, though. Enter the internet. In the age of social media, everyone is dying to showcase their beautiful designer homes to the watching world. And thankfully, with the help of sites like Instagram and Pinterest, you can do a little copycatting to turn out some beautiful spaces. Today we’re going to look at three gorgeous celebrity nurseries. We’ll discuss how you can copy the look for your own mobile home nursery. And we’ll take a look at some clever hacks to make it look like it was designed by one of the greats. Kourtney Kardashian’s cotton candy nursery isn’t just pink. Everything, from the coordinating baskets, to the peppy pink rug, to that aqua beaded chandelier, is carefully calculated to bring texture and vibrancy into the space. And wallpaper on the ceiling? Brilliant! Especially in a mobile home that has paneled walls, adding wallpaper to the ceiling would be a great way to liven up the room without replacing your existing walls. After you’ve picked the wallpaper, just paint the paneling the color of your choice and voila! If you are feeling a bit extra, you could even drywall the upper half of your walls and leave the paneling below (with some chair rail to separate the two, of course). This would give a similar effect to the lattice Kourtney has instead of wainscoting here. This room would look great in almost any color scheme, too. Just trade the shades of pink out for whichever color is calling your name. 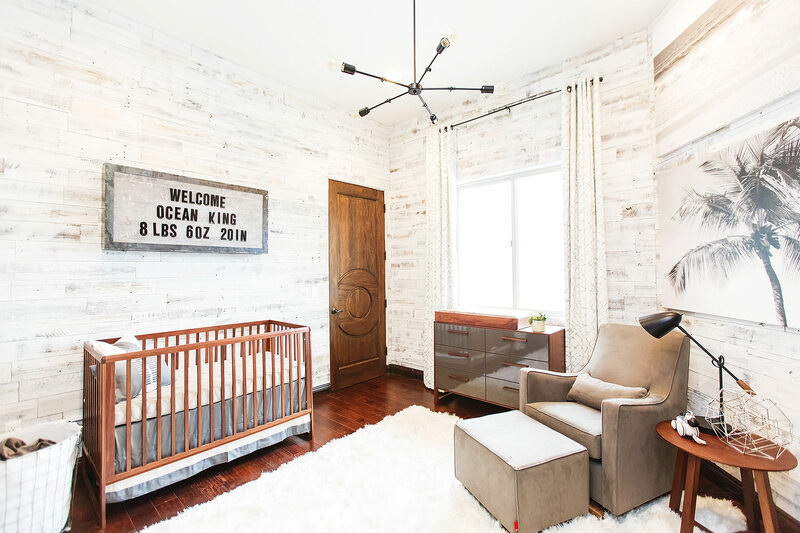 With its “weathered” stikwood wall and warm neutral green accents, this cool rustic nursery is giving us the best kind of vibes. If your mobile home already has warm wood tones then this might be a great one for you. Try to keep some of those original tones, especially on the doors and floor, while also adding a light grey paint. We love the idea of a stikwood wall, which isn’t hard to install over your existing walls. If you are looking to cut costs, try whitewashing some faux wood paneling for a similar effect. Of course, this nursery wouldn’t be the same without the amazing pops of green. These pieces give it an inviting touch of color while still somehow feeling like they’ve kept the whole room neutral. We don’t expect most mobile home nurseries to be quite this large. So it is extra important that you keep the floors clear of clutter. This will help you achieve the easy, breezy, open feel that Alexa created for little Ocean King. Wish we could turn back time to the good old days. And it looks like Haylie Duff did just that with this nostalgic nursery design. By the looks of things, wallpaper is back on trend, and we’re not sad about it. Gone are the days of country geese and mauve heart patterns. Today’s wallpapers are refined and sophisticated, just the way we like them. 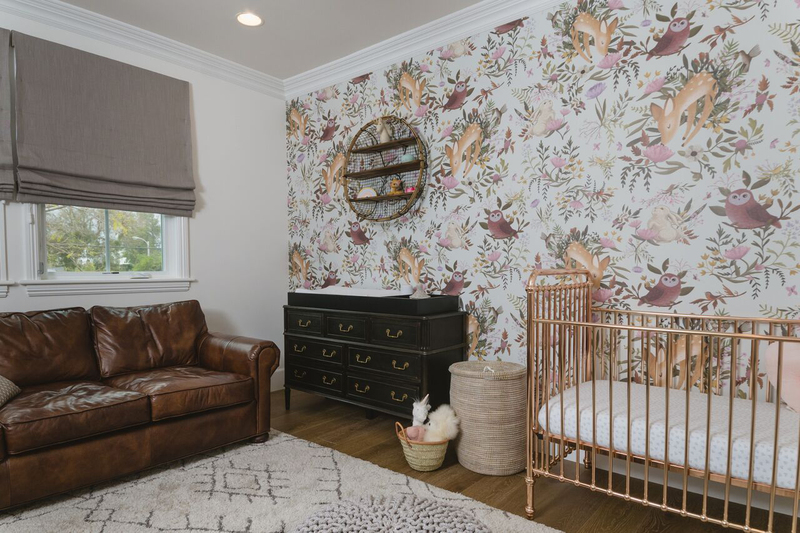 Haylie Duff picked a whimsical, pink-hued woodland paper for her statement wall. However, simply change out that print for something more masculine or gender-neutral and this room would easily cover all your needs. It would even be a perfect space for twins! While that rose gold crib is certainly stunning, the price tag is a bit of a wakeup call. We love this gold one as a budget-friendly (and gender neutral!) alternative. And yes, the incredible camel leather sofa certainly lends a luxurious, vintage vibe to this room. However, a smaller (but still just as awesome!) leather chair can be a great solution for the more limited space of a mobile home nursery. 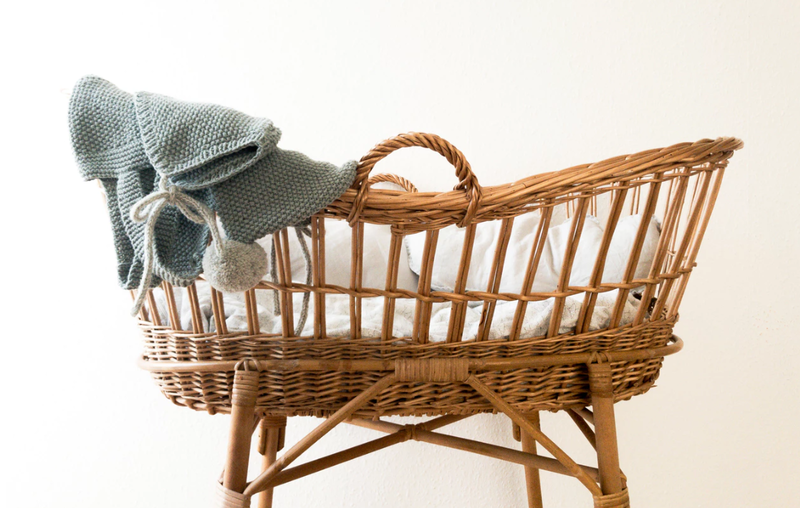 You don’t have to be a celebrity or a pro to design the perfect space for your own sweet bundle of joy. Sometimes we just need a little inspiration to get our creative juices going. So in addition to our list of beautiful celebrity nurseries, here are a few more gorgeous spaces. They were simply dreamed up and brought to life by everyday parents with an eye for beauty. Pink and Dreamy. If soft pinks and hints of boho are what your dreams are made of, then we think you’ll love this sweet baby girl nursery. The pale colors are perfect for making small spaces look bigger, and we love how that chandelier adds a touch of elegance that will grow with your little one. Bright and Natural. We love how this nursery is mostly bright whites and other neutral tones, with just a touch of color from the blue dresser. We definitely get a hint of vintage here, but it still feels very fresh and modern. This design would work well in a small space, too, and would be easy to adapt for other ages if your baby will be sharing a room. Classic Themed. Maybe bright, bold colors and classic themes are more your jam. If that sounds like you, then you should take a look at this incredible circus-themed nursery! Everywhere you look there are fun, interesting details, and we especially love those custom bookshelves on the walls. What a great way to save space! Our little ones are given to us to love and guide. Creating a nourishing and healthy environment is our responsibility. So while you enjoy this time of preparation as you anticipate the arrival of your tiny new bundle, don’t forget your goal. Remember that you are making a loving space for baby to grow in and to learn about this big, beautiful world. As you get your home ready for a new little one, you may want to take a look at our article on creating other kid-friendly spaces throughout your mobile home.